When I spotted this British organic beauty brand in Liberty I was drawn in like a beauty homing pigeon. Faultless natural credentials? Check. Pioneering ingredients promising results? Check. And expensive enough that surely it had to work? Checkeroo. 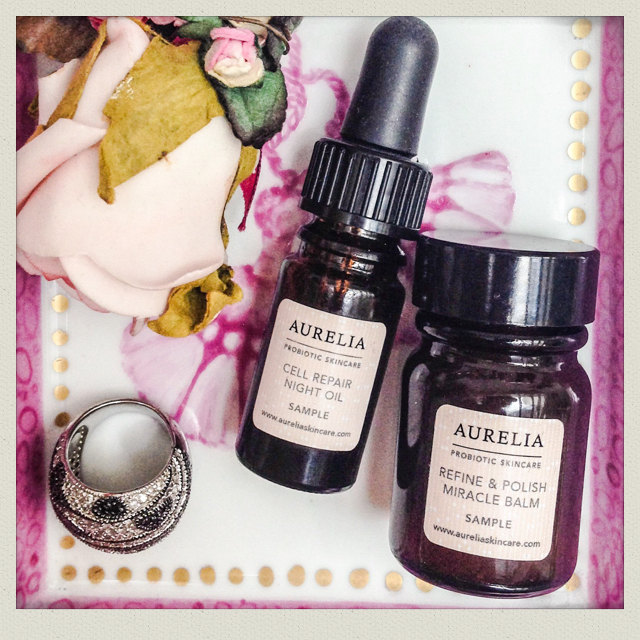 Aurelia Probiotic Skincare screams ‘luxury product alert’. And if you fancy treating yourself then this multi-award winning line of probiotic skincare could be for you. This is something really special. Almost syrupy in texture it warms slightly as you apply it to the skin. You can use it as an instant exfoliator but it’s wonderful left on as a treatment and it really made my skin glow. Like the oil below, you only need a small amount, which is just as well as handling these products feels a bit like handling liquid gold. Active ingredients include probiotics, sugar maple sap, hibiscus (‘nature’s Botox’, according to Aurelia’s website) and essential oils of chamomile, eucalyptus, rosemary and bergamot. A powerful mix of botanicals to nourish the skin and essential oils of lavender, rose, mandarin and neroli this product means business. Applying it nightly felt like a bit of a ritual, breathing in the essential oils was as much a part of the benefits as massaging in the oil. It’s delicate, both in fragrance and feel, and is very easily absorbed so if you don’t like the heaviness of standard face oils this could be a good choice. So, apart from the instant effects above, did I notice a difference? In reality I think you would need to use these products long-term to unlock their full potential whilst I was just reviewing samples I’d kindly been sent over about a month. But what I love about this brand is their philosophy towards clean, high quality ingredients, and their responsible sourcing of those; their commitment to cruelty-free cosmetics; and their transparency in labeling. A truly luxurious offering and surely the Crème de la Mer of natural organic skincare.